As the trailers indicate, Red Riding Hood is a fantasy fairy tale with a twist of Twilight, but it doesn't quite come together, despite some striking images and a strong performance from Seyfried. 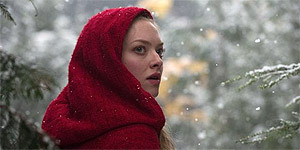 Directed by Catherine Hardwicke (Twilight), Red Riding Hood stars Amanda Seyfried as Valerie, who lives in a forest-bound village with her parents (Virginia Madsen and Twilight's Billy Burke) and her sister, and occasionally visits her devoted grandmother (Julie Christie) in a remote cottage in the woods. When her parents arrange her marriage to strapping, wealthy blacksmith Henry (Max Irons), Valerie throws the mother of all sulks, because she's been in love with equally strapping poverty-stricken woodcutter Peter (Shiloh Fernandez) since they killed a rabbit together as children or something. However, all arranged-marriage based shenanigans are put on hold when the village is terrorised by a local werewolf during the arrival of a blood-red moon. And to make matters worse, fanatical werewolf chaser Solomon (Gary Oldman) shows up and promptly announces that said werewolf is SOMEONE IN THE VILLAGE! Amanda Seyfried is perfectly cast as Valerie (Hardwicke puts her pouty, wide-eyed innocent look to good use), while Oldman is on fine scenery-chomping form and clearly enjoying himself as Solomon - his commitment to the werewolf destroying cause story is unintentionally hilarious. Similarly, whoever cast Virginia Madsen as Seyfried's mother is clearly some sort of genius and deserves an award of some kind, though Christie is oddly under-used as the grandmother. The film looks gorgeous throughout, courtesy of Mandy Walker's striking cinematography and some impressive production design work; indeed, the shots of red riding hood-clad Valerie in the snowy landscapes almost make up for the film's flaws elsewhere. Almost. The main problem with the film is its terrible script, which does a good job of concealing the mystery identity of the werewolf but fails to provide a compelling story to go with it; for example, having set up Peter and Henry as Twilight-style rivals, it then immediately drops that idea so that they never even fight each other. It also doesn't help that Irons and Fernandez are charisma-free zones – they're no Edward and Jacob, let's put it that way. In addition, the dialogue is mostly dreadful and the film also commits the cardinal sin of all werewolf movies by not including a transformation sequence. Despite some gorgeous visuals and a strong performance by Seyfried, Red Riding Hood is ultimately a bit of a disappointment, thanks to a lacklustre script and limp performances from the two male leads.